This easy homemade granola recipe is a delicious combination of oats, honey, maple syrup, cinnamon, and pecans. It’s the perfect healthy breakfast! 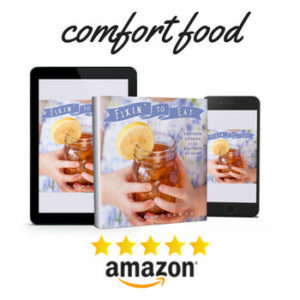 I really wanted to make my own homemade granola, because I figured that not only would it be less expensive than store-bought, it would taste better and be better for me. It turns out that both of those theories were entirely true. 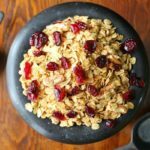 This homemade granola is delicious and it’s healthy, something that you don’t always see in combination. With a touch of sweetness from maple syrup and honey, the warmth of real cinnamon, and the crunch of toasted pecans, you’ll look forward to your first bowl of the day. I promise that you will say the same thing, although I encourage you to avoid actually kicking yourself. You don’t want anything to take away from your enjoyment of this stuff. 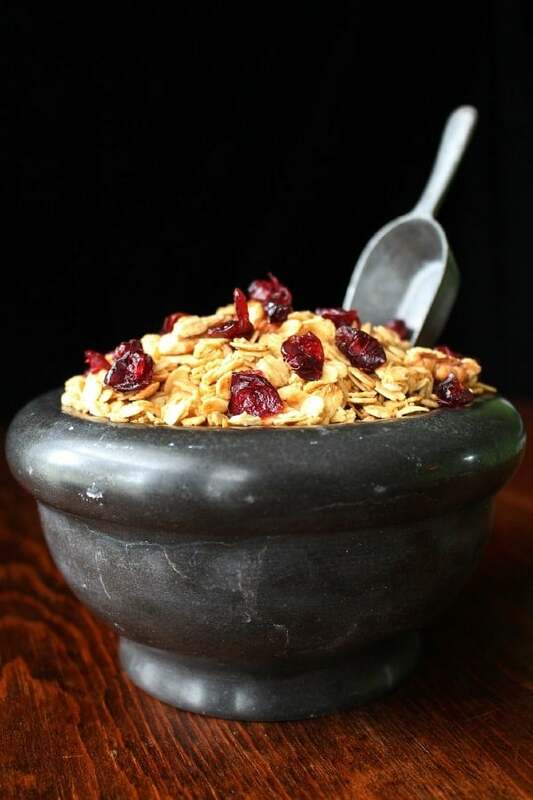 Many homemade granola recipes have you mix in dried fruit with the finished and cooled granola. I actually chose to store my granola on its own, and simply sprinkle cranberries (or whatever) in the bowl when I was ready to eat. Why? Because the fruit will dry out just a bit more if you store it in the granola. However, it’s not a huge difference, so feel free to mix it right in if that’s what you prefer. Either way, store your granola airtight for maximum freshness. You’ll notice that the recipe contains 4 cups of oatmeal and 1 cup of pecans. That means you can easily substitute other ingredients so long as you keep the total volume at 5 cups. For example, you could swap out a cup of oatmeal for a cup of coconut. Or switch the 1 cup of pecans to 1 cup of walnuts. You can also change the sweetener. The recipe calls for 1/4 cup of maple syrup and 2 tablespoons of honey. You can reverse it to 1/4 cup of honey and 2 tablespoons of maple syrup, or simply use 1/4 cup plus 2 tablespoons of just honey (or just maple syrup). It’s very flexible. If you like this granola, you might also like these delicious oatmeal breakfast cookies, or maybe you can try topping your toast or bagel with my fresh strawberry cream cheese! I’m also partial to pancakes from scratch. This easy homemade granola recipe is a delicious combination of oats, honey, maple syrup, cinnamon, and pecans. It's the perfect healthy breakfast! Preheat oven to 275 and line two baking sheets with parchment paper. In a large mixing bowl, combine the oil, maple syrup, honey, water, cinnamon, and salt. Whisk until well combined. Add in the oats and pecans, then stir until the mixture is evenly coated. Spread evenly onto the parchment lined baking sheets. Bake for 30 minutes, stir, then bake for another 10 to 15 minutes until golden brown. Remove from oven and let cool completely before storing in an airtight container. Parchment may be reused for future batches of granola. 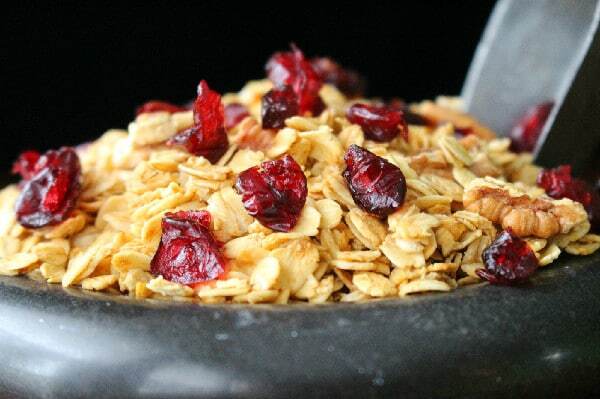 If you love breakfast cereals like this granola, check out everything you need to know about muesli! We love homemade granola! This recipe looks great … and that first image? You could frame that! Beautifully done. 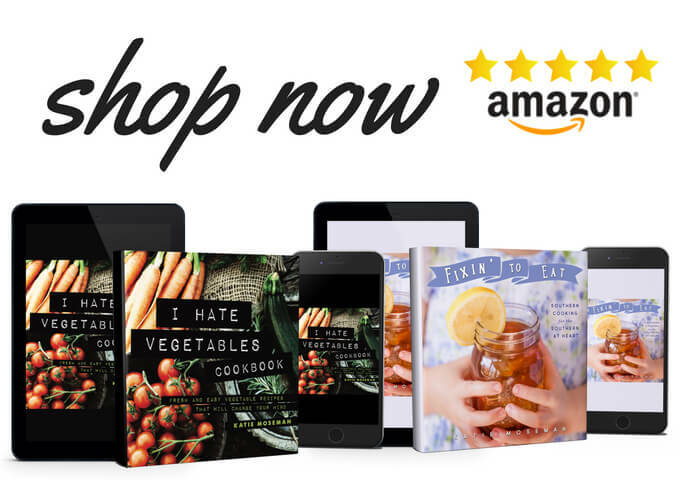 Your recipes are a delight! And the photography is lovely. Keep up the good work because your fans love to see your posts. Love homemade granola! And I love your tip about storing the fruit separately. The fruit does dry up after a while. Love this recipe!! Let me know what you think! It’s got just enough honey/maple syrup to give it a touch of sweetness, and I always throw in some dried fruit for a little extra sweet taste. Love the recipe Katie! A touch of Cinnamon does elevate the flavor! I am now obsessed with Ceylon cinnamon- it’s opened up a whole new world of flavor! Pecans are my favorite nuts and I had some left over from making pecan pies for Christmas so I think I have everything to make this granola. Looks so good! This looks good! Maybe a great addition to yogurt for a good breakfast treat. Thanks for sharing! Granola is something we make and eat tons. Goes for snacks, lunches and cereal. We love pecans. That sounds delicious! I love granola in my yogurt or with ice cream. I think I need to make this! I never thought to make my own granola! I love granola but hate how expensive it can be! I love granola but I don’t think that I have ever made it myself. It seems really simple to make it though, I need to try. This granola recipes looks and sounds so delicious. 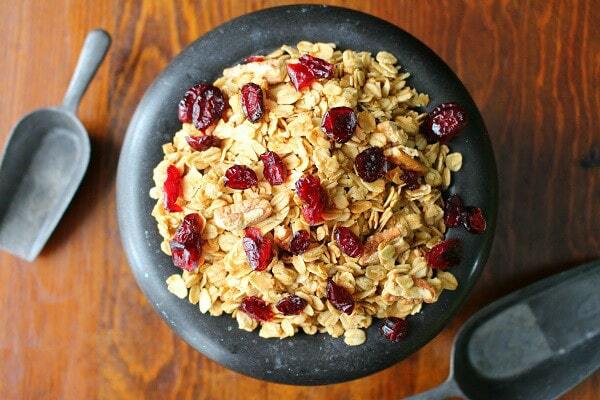 It’s so easy to make this granola. I can’t wait to try this recipe. This sounds amazing! I may have to get the ingredients and try it out myself. I wonder how almonds would be in it… like maybe sub some almonds in the mix. Yum! This sounds good. I think my favorite of the bits are pecans. I wouldn’t mind toasting them to make this treat. Yummy! that looks and sounds great! I’ll have to give this a try… it looks so crispy and yummy : ) thanks for sharing how to make homemade granola with pecans! I love granola! It’s about time I start making my own. I can definitely see this becoming a new favorite mixture for breakfast. First of all: beautiful photos. Second of all, I would totally snack on this all day! This recipe for easy homemade granola with pecans is something I am going to have to try. My sons love any kind of granola but I have never made it homemade before. They would for sure love this recipe. Thanks for sharing this awesome recipe. Homemade granola are the best because you can incorporate the ingredients that you really like. 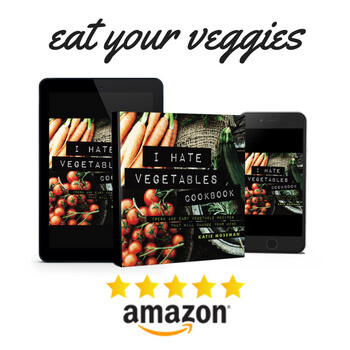 Thanks for sharing youyr recipe. I have always wanted to make my own granola, but I haven’t tried it yet! Perhaps I should give this recipe a try! It looks really good! Perfect match for my tea. yummy! thank you for sharing your ingredients.